If the first Avengers movie still ranks at number 5 in highest grossing films, there’s no doubt that the culmination of phase 3 will take over the box office. 2. Lipgloss will overtake the matte lip trend. Matte lipstick is just drying and uncomfortable and needs constant reapplication. Lipgloss is where it’s really at. 3. North Korea will continue to make empty nuclear threats. 125 artists sat down to paint every single frame of the Van Gogh-esque film. Loving Vincent would be a win not only for the film, but also for the animators who continue to work by hand. 5. The internet will forget about Net Neutrality after their web experience stays the exact same. 6. USA will get the most medals in the winter olympics. I mean, with Russia knocked out of the competition, it’ll be a piece of cake. 7. In the end, Kylie Jenner will not be pregnant. 8. And Khloe will have a boy. 9. The kale trend will die down. I mean, it’s great, but it’s better in moderation. I mean, other than Alex who is there really left to care about? 11. Hulu will overtake Netflix as the most popular streaming service. Let’s all admit that Netflix has been going downhill, and that Hulu is on the rise. 12. Solo: A Star Wars Story will, disappointingly, flop. The fact that it’s almost four months out and there’s yet to be any promotional material is extremely telling… but I have my fingers crossed. 13. The Panera hype in Rockwall will die down. Listen: La Madeleine has just as tasty food (and more of it) for a much lower price. 15. Logan and Jake Paul will succeed despite controversy. Look at One Direction- when you have a 12 year old fanbase you really can’t fail. 16. Target will continue on as the best shopping chain. If you can name a different store that I can comfortably walk around in for an hour, I’m all ears, but until then Target is top dog. 17. 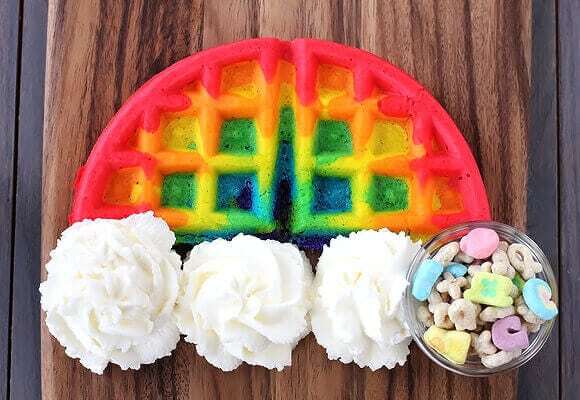 The rainbow food trend is going to fade away. You’re literally paying for food coloring. 18. No matter what, it’ll be better than 2017.